When Naomi moved into her new home the décor was very dated and didn’t fit with her contemporary taste. As part of a big redecorating project, every room was given a top-to-toe revamp and when attention turned to the finishing touches, new blinds were at the top of the list. The patio doors in Naomi’s lounge lead out to the garden. As the sun moves around throughout the day the sunlight causes glare on her TV screen. 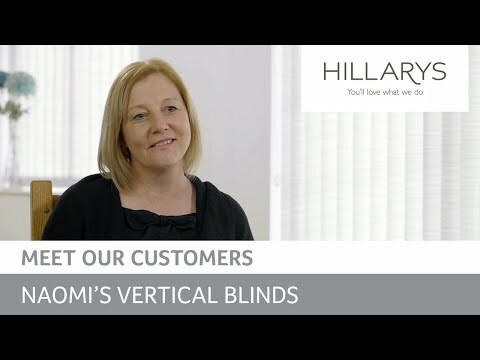 Acting on the recommendation of a friend she made an appointment with Hillarys to find out how blinds could help. What does Naomi think of the Hillarys in-home measuring and fitting service? So how does she feel about her new Vertical blinds from Hillarys? Considering Vertical blinds for your home? Take a look at our short video following customer Naomi, who wanted blinds to finish the large window and doors that led out to her garden. A friend recommended the Hillarys in-home service, so she arranged a free home appointment to find out more about the Hillarys range and what would work best with her contemporary décor. Dressing a window or a door is a great opportunity to make a statement. It’s less of a commitment than getting the paintbrushes out, here are our top tips to making a statement. We give you our top tips for keeping your Vertical blinds in tip top condition.